WARNING: Spoilers below. Seriously, stop reading now if you don't want them. Go, watch the show, come on back afterwards. Done? Right, let's begin. THERE'S something very refreshing about Defiance - and it's something that the show puts front and centre from the very moment it starts. The series begins with a dream, and a voiceover, that takes a moment to set the scene on the time when the Earth of this sci-fi show changed forever, when huge spaceships first broke through the clouds above. As the dream of the past ends, we shift into the show's modern reality and meet the narrator. An alien. An honest-to-goodness alien, prosthetic features, peculiar contact lenses and all. There's no hiding from where this show is planning to take us - we're boldly going, you might say, to a future that TV hasn't tried to show us for some considerable time. Think of the recent sci-fi shows of our time. Battlestar Galactica had humans and robots, Revolution has humans and no power for robots, Fringe has humans in different dimensions and assorted weirdness, FlashForward had humans and prophetic dreams - about the only show that offered aliens right off the bat was The Event. However, The Event proved to also offer no hope of a second season, so let's hope that's not an omen for Defiance. Besides, not just content with offering one alien race, Defiance offers a wealth of them. Eight in all, it seems, having reached Earth in those mighty Arks seen at the start, bringing with them exotic technology but not a trace of racial harmony. Instead, the races are bitter and divided against each other, much like many of the inhabitants of the city of Defiance, the eponymous setting of the show, renamed from St Louis after one of the famous battles in the wars that followed the arrival of the aliens. Where the show works is in the chemistry of its stars. Rather than filling its ranks with pretty young unknowns, the cast is filled with actors who have been there, done that and know how to do it again. You've got Julie Benz, formerly Darla from Buffy, as the town mayor. Her sister is played by Mia Kirshner, probably best known from The Vampire Diaries and The L Word. New Zealander Grant Bowler arrives in his Han Solo-style shoes via True Blood. There are other familiar faces too - such as Twilight's Graham Greene, or Jaime Murray, from Spartacus and Hustle, not that she's easily recognisable at first under her alien make-up. Where the show doesn't work so well - so far at least - is in the special effects. The show is linked with a computer game, more on that in a moment, and I can't help but think that some of the graphics looked more like a game than a convincing piece of television, particularly in the big battle that the premiere builds up to. As weaknesses go, that's not terrible. It's certainly forgiveable. At least it's willing to reach for the big, broad events and show them rather than sidestepping them or having them take place off screen. The show does also create a couple of other potential pitfalls in its premiere - such as a Romeo and Juliet-style romance between two of the younger cast members. Those who watched Terra Nova will have shuddered through the clumsy teenage stories there, but thankfully Defiance seems not to dwell on that thread for too long, simply using it as a plot point and then moving on. The computer game angle is novel. The game offers the chance to further explore the world, and the way the game progresses will reportedly feed back into the show, and vice versa. You don't need to play the game to enjoy the show, but it's a dynamic whose payoff will be interesting to watch. There's a nod too to the current Holy Grail of sci-fi shows, albeit one that was another on the alien-free list. It's time to mention the F word. Firefly. Bowler's lead character of Nolan is certainly no Mal Reynolds, but he drinks at the same bars. Though they might be called saloons and share that same Wild West vibe. They won't be on frontier worlds in Defiance, but a remade frontier back home on an Earth going backwards fast no matter how shiny the technology now available. 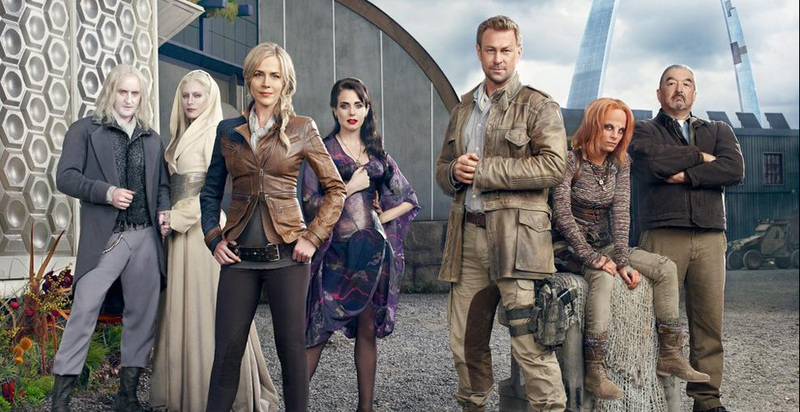 If Defiance can live up to its potential, then Babylon 5 might at last have a true successor.